I mentioned a few comics ago that I had an idea the aliens could bring to “Skitter” that could open up some possibilities. This comic is that new idea. This means she can stand eyeballs-to-eyeballs with Jack and the other bugs! Should get interesting! 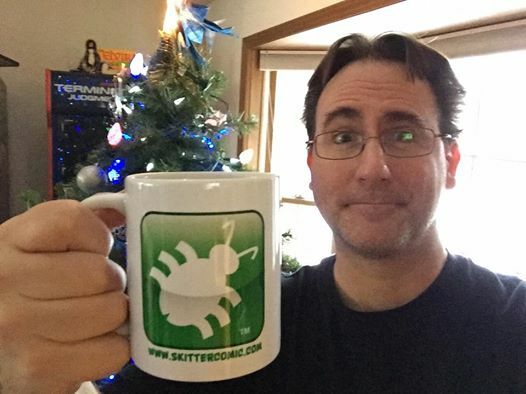 Tuesday I forgot to mention that those of you who signed up to receive Skitter email will be part of a drawing to win a Skitter mug. I’ll try to video the drawing this weekend and post it online. The winner will be chuggin’ joe Skitter-style in no time! *LOL! * You smooth operator; you! I know; right? Lursa makes me want to recite love poetry and duck a lot. We’re dead meat, man! Game over, man; game over! We’re gorun dust; dude…! You can quote “The Last Starfighter”? I’m impressed!